Get a taste of the local market life on this Hong Kong walking tour of the Mongkok district. Your friendly local guide will unlock the stories, history and culture of this eclectic destination as you wander the Mongkok Wet Market, Jade and Goldfish markets, too. This half-day tour is the perfect way to stock up on souvenirs and handmade items before you head home from your incredible Hong Kong adventure! 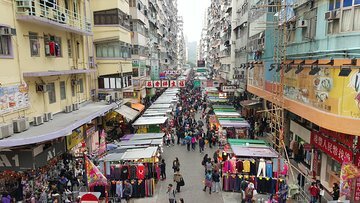 This half-day Hong Kong market walking tour of the Mongkok district kicks off wtth a fun-filled ride on an open-top sightseeing bus in Kowloon. You’ll make your way to the famous Mongkok district, which is known for having the highest population density in the world. Upon arrival, you’ll experience the energy, chaos and excitement of local shops, produce markets and daily life in this colorful destination. You’ll make stops at the fresh meat and vegetable shop known as the Wet Market, then make your way to Fa Yuen Street Market, known for its clothing, jewelry and other wearable goods. Your guide will also take you through the stunning Flower and Jade Markets before you wander past the Yuen Po Street Garden and Goldfish Market. This incredible tour also includes a stop at Tin Hau Temple, one of the oldest and most traditional complexes in Hong Kong. Have your future told by a local mystic or settle in for a game of chess with locals under in the shade of nearby banyan trees. When the tour ends, say goodbye to your guide and send the rest of the day seeing the sights with your Kowloon Big Bus pass, included in the package. Deano, our guide, was wonderful. He had great knowledge of Hong Kong which he shared as we visited all of the markets. This is our fifth walking tour with Viator and each has been excellent. I can't say the same for their bus tours. Walking is the best way to see any city and Deano made walking Hong Kong a delightful experience. I highly recommend this tour.